But is it a weed? Some plants are so finely balanced between being wonderfully desirable and downright weedy. 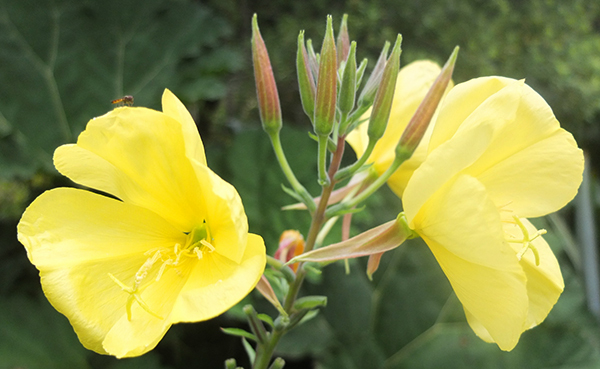 The yellow Oenothera biennis, or common Evening Primrose, is one such for me. So is this easy-going biennial a potential pest? It certainly provides lots of seedlings, but this in itself is not a clear indicator. The word 'generous' definitely springs to mind, and yellow is such a cheerful colour at the best of times. My garden has space for these tall, pretty yellow flowers, and my bees like them. Here's another thought. 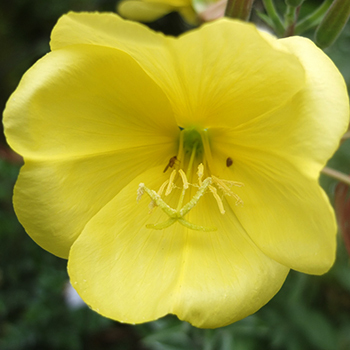 Weeds are often difficult to pull out, but there's no problem with any Evening Primrose seedlings that I don't want. As biennials they provide some neat green leafy rosettes to cover the soil through winter. Hee hee - maybe I'm just using a large weed to supress other smaller ones. Just because you're easily grown, and tolerate poor soils, doesn't mean to say you have little value in a garden. I decided to ask Mister Google about Evening Primrose's weediness, and found this rather nice reply by George Weigel. I like his concept of 'plant friskiness'.